East Greenwich, RI (March 17, 2015) — Corvias Military Living, the military housing division of Corvias Group, announced today that it earned the highest resident satisfaction score for 2014 among companies with portfolios larger than 10,000 units from SatisFacts. 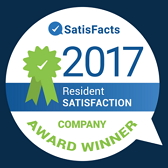 This award marks the seventh year in a row that Corvias has ranked first nationally in the SatisFacts Annual Resident Survey, and the eighth consecutive year it has achieved the Superior Company Score award. Out of a possible 5.00 score, Corvias Military Living residents gave the company a 4.29 in the 2014 survey. Corvias earned the Superior Service distinction at 32 of the military communities the company manages throughout the country with a score of 4.0 to 4.49. Eight communities earned the highest honors, Exceptional Service achievement, with a score of 4.5 or above, highlighted by Randolph Pointe's score of 4.79. "Corvias Military Living has always had great passion, focus and quality assurance. Their 2014 national award winning performance once again validates this, as it is consistent with the award winning scores they have received from us every year," said Doug Miller, founder and president of SatisFacts. "What makes even more significant is that Corvias is delivering this caring, consistent and superior approach to people who deserve this treatment more than any resident — members of the Armed Forces who have dedicated their lives to our country." Corvias' military housing portfolio is comprised of almost 25,000 homes on more than 10,000 acres of land across 13 Army and Air Force installations from Alaska to Florida. As part of their efforts to continuously improve quality of life for service members and their families, the company has renovated 11,474 and built 7,442 homes and 30 community centers over the last 12 years.